The telescope, which is part of the European LOFAR (Low Frequency Array) project, will ‘listen’ to the Universe at FM frequencies, helping astronomers detect when the first stars in the Universe were formed and to reveal more about how the Universe evolved. It was officially opened yesterday (20 September) by Dame Jocelyn Bell Burnell, who discovered the first radio pulsars, at a ceremony at the Chilbolton Observatory, near Andover in Hampshire, which is part of the Science and Technology Facilities Council (STFC). 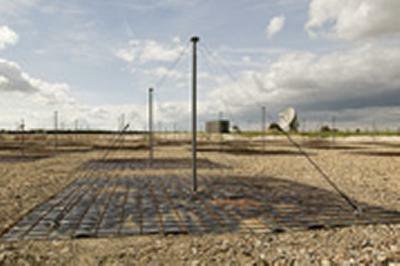 LOFAR is a European project being led by ASTRON (the Netherlands Foundation for Research in Astronomy) which when complete, will see over 5,000 separate antennas grouped into ‘stations’ all over Europe, including the Chilbolton Observatory, to form the world's largest and most sensitive radio telescope. LOFAR works at the lowest frequencies accessible from Earth which, combined with the latest in high-tech computing, allows wide areas of the sky to be surveyed opening up new possibilities for astronomers.